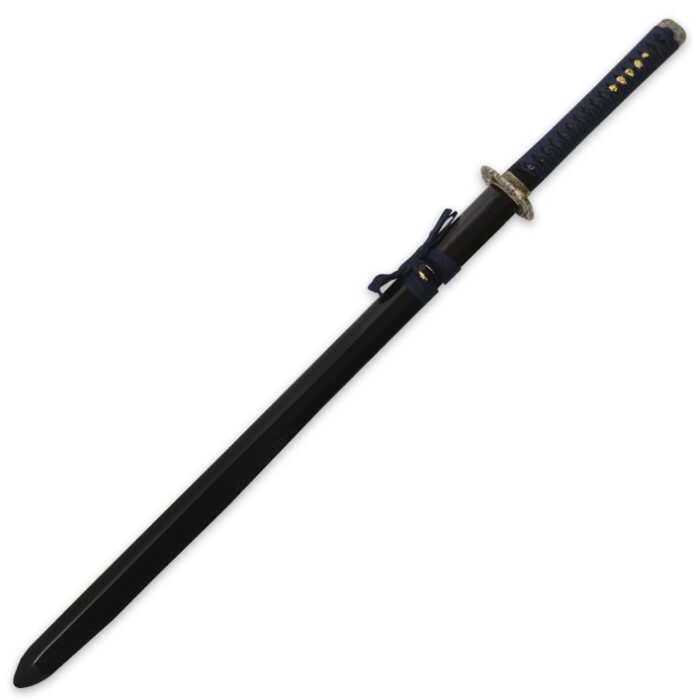 Shinwa Double Edged Regal Navy Blue Damascus Katana Sword | BUDK.com - Knives & Swords At The Lowest Prices! This latest offering from Shinwa brings you a stunning double-edged blade hand forged by master Shinwa swordsmiths in the traditional katana design. 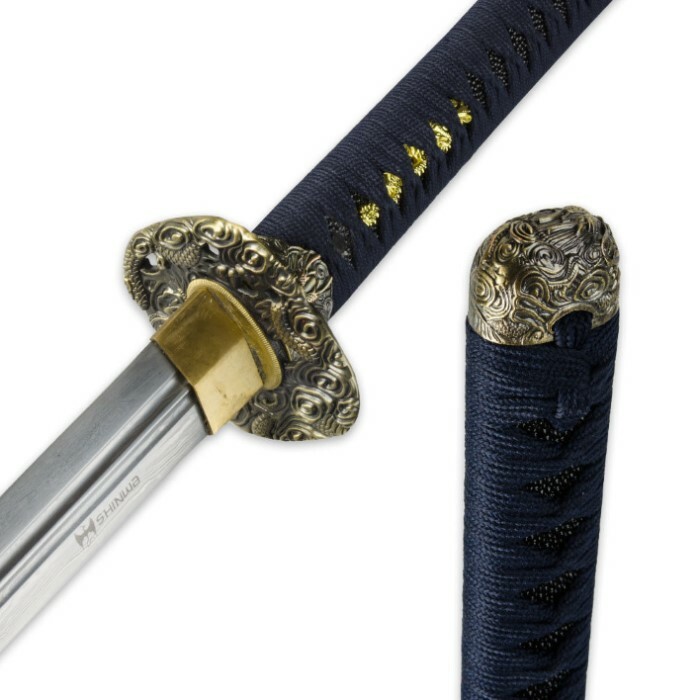 This top-quality katana sword combines tons of authentic details and intricate accents to bring you a custom look and feel at a price you can afford. From the ornately cast tsuba and brass-plated menuki to the ray skin and cord-wrapped handle, this katana has a one-of-a-kind look and feel. The coordinating lacquered scabbard houses the 28-3/4" blade. I do not understand the hostility towards this Shinwa Sword.......When I got it the blade was straight, scabbard was clean, handle was solid (for now). Like all double edged "damascus" swords the blade is not as solid as a single edged katana blade. This is just common sense though because of the way its manufactured (Single edged thicker / double edged thinner). For the sale price, I think its a very good buy for people who want to add a double edged sword to their collection. first off these are NOT FULL Tang and also you would have to know a pretty nice black smith to get damascus steel at this price. lies and [email protected] aside its not a bad sword it does come covered in wax but thats good it keeps your blade nice while it sits in the warehouse it slices and dices but dont be expecting to have it forever if you do. in my opinon a nice buy for the price. they should stop with the full tang crap and damascus is more then a design on the blade its the blade itself. The blade on this sword is good but the handle is poorly constructed. The wood cracked after a few wacks at a fairly small branch. Got this on one of BudK's 30% sales. For the record, this is not a katana. As a Japanese straight sword, this is better known as a "tsuguri." Along with other things in my cart, I ended up paying $50 for it. When I received the blade, it was nice, sharp, and had a good weight to it. Sheath was also well-made, also came with a nice storage bag. It has damascus patterns all over the blade, but for well under $100, it's definitely not damascus. Like the other review, the blade had a preservative wax on it, but choji oil works well in removing it. Despite being a great budget sword, I have two problem, the first being a loose tsuba upon receiving the sword. The second, after doing research, is the fact that Shinwa swords apparently glue the tang of the blade to the handle, for "added durability." This makes proper sword maintenance very difficult as you can't remove the handle very easily, making me unable to fix my tsuba issue. Also, I know that katanas can traditionally have one peg to hold everything together, but the glue also makes it difficult to verify if the sword really is full tang or not. In the meantime, I worked around my loose tsuba by wrapping floss around the tang between the tsuba and handle, a quick fix I found online. Overall, a great purchase for those who wish to purchase a first "real" sword. 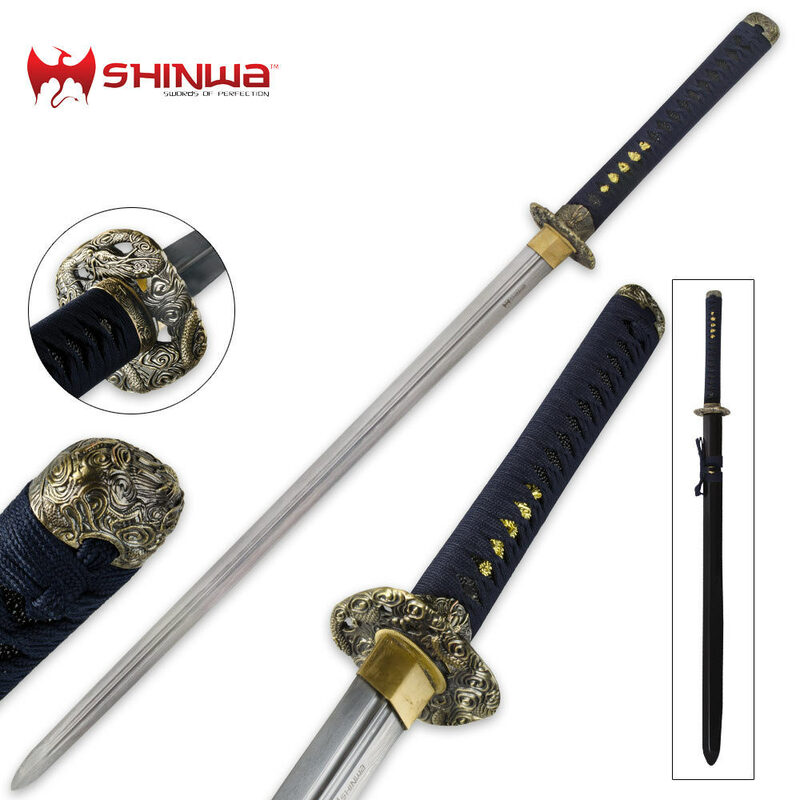 This sword from the Shinwa manufacturer is an awesome sword for martial artists and sword collectors. The blade is Damascus you can see the patterns on the blade of the sword. The edges are all sharpened not dull. Of course it had that annoying blade preservative wax on it, it came off easy after I applied choji oil to it. If want a hand forged sword and you dont want to pay a huge amount of money, get a sword from Shinwa. sword came bent, had to straighten. poor quality, plastic and wax was everywere. Not worth the price ! Response: Please contact customer service at 800-735-3326, and we will be happy to negotiate a refund or exchange for you.